The governing New Patriotic Party has tasked its Steering Committee to investigate Nana Obiri Boahen, the party's Deputy General Secretary, for alleging that the presidency donated about GHc50 billion towards the party's 2017 National Annual Delegates Conference held in Cape Coast in the Central Region. Obiri Boahen in a leaked telephone conversation that has gone viral complained bitterly about some happenings in the NPP and lamented that he has been sidelined in the sharing of the national cake. 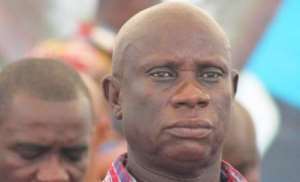 In the audio, Obiri Boahen is heard alleging that despite being faithful to the NPP even when they were in opposition, he is not benefiting like others are doing. He among other things alleged that the presidency gave out GHc50 billion in support of the party's Delegates conference held in 2017 in Cape Coast. The NPP in the statement said it is awaiting the recommendation of the Steering Committee to make a determination on the matter. The attention of the New Patriotic Party (NPP) has been drawn to a secret recording making rounds on social media involving the deputy general secretary of the party, Nana Obiri Boahen, in which he alleged that the Flagstaff House advanced an amount of “GHC 50 billion” to the NPP in support of the conduct of the party’s 2017 National Annual Delegates Conference held at Cape Coast.